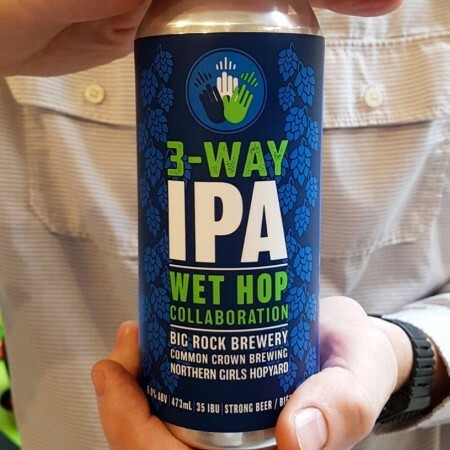 CALGARY, AB – A pair of Calgary breweries and a local hops farm have announced the release of a collaborative wet hop IPA. 3 Way IPA was brewed using Alberta Heritage Select Malt as well as Munich and Caramel Malts. This produced a perfect sweet and spicy base for the fresh hand picked Cascade Hop cones that were picked that morning at Northern Girls Hopyard and driven to the brewery, then added to the brew kettle within 4 hours. The result is a refreshingly aromatic Wet Hop IPA, with scents of floral grapefruit and sweet citrus, with a subtle hop bite that is bursting at the seams with Wet Hop Freshness in this golden amber beauty. 3 Way IPA will be available in 473 ml cans at beer retailers throughout Alberta while supplies last.